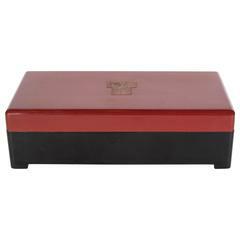 This stylish large-scale American Art Deco bakelite box dates to the late 1920s to the early 1930s. 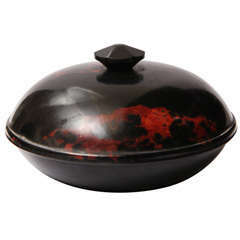 The piece is detailed with convex fluted sides and lid with a central medallion of Pegasus. FYI Usually depicted as pure white, Pegasus is a child of the Olympian god Poseidon. He was foaled by the Gorgon Medusa upon her death, when the hero Perseus decapitated her. Pegasus is the brother of Chrysaor and the uncle of Geryon. This stylish and charming Maitland Smith duck box will make a great place to hide the remote, car keys or desk accessories. 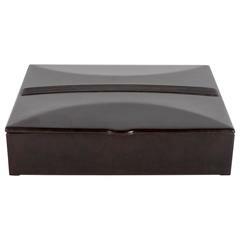 This stylish and chic storage box was created in the 1980s by Maitland Smith and it will keep you organized or perhaps as an object of beauty on its own. This stylish box was created by Maitland-Smith and date to the late 1980s. 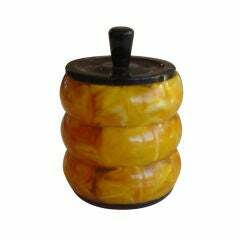 This small intimate vessel features three connecting round disks that are end of the day colors in yellows and brown. 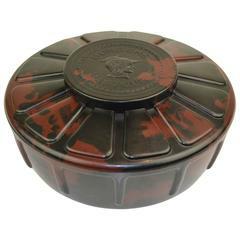 For all you Bakelite lovers!